1891. Road bridge on the Shawford Line. of 11 Victoria Street, London. The DN&SR was authorised in 1873 and became part of a series of 'railway wars' in the south of England between the Great Western Railway and the London and South Western Railway (LSWR). The idea for a railway running the length of Hampshire stemmed from a proposal for the Manchester & Southampton Railway during the 'Railway Mania' of the 1850s. The plan never progressed, but the idea of a railway linking the industrial areas of the Midlands was revived in the 1870s, when the growth of the railway network meant that main lines reached Southampton via Oxford, Reading and Basingstoke. 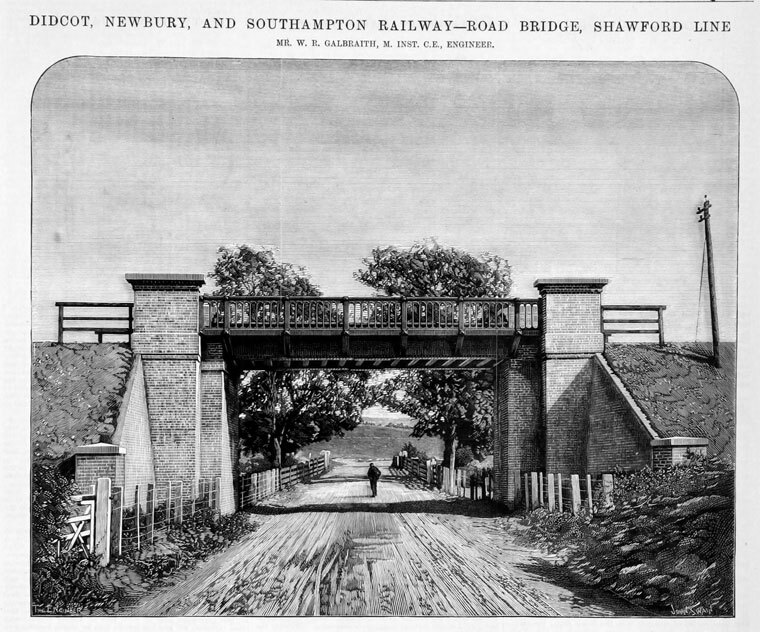 This was an indirect and complex route, and in 1873 a formal Bill was sought for the construction of the Didcot, Newbury & Southampton Junction Railway. Originally, the proposal called for a junction with the South Western Main Line at Micheldever, but the LSWR rejected this, and so the company sought its own, independent track to Southampton. At this stage, the 'Junction' part of the name was dropped. The DN&S was proposed as a short cut to the coast, saving six miles compared to the existing route through Reading. Although planned as an independent concern, the DN&SR Company soon realised that it lacked the resources to build and operate a railway from scratch. The Great Western Railway agreed to work the new line, providing locomotives (and their crews) and rolling stock. This was greatly to the GWR's advantage, as it allowed it free access to the increasingly important port of Southampton, and provided a fast route into the heart of its main rival's territory. Recent LSWR expansion in Devon and Cornwall (the LSWR's tracks reached Padstow at their most westerly point) and the construction of the Somerset and Dorset Railway (a joint LSWR/Midland Railway venture) made the GWR eager to expand its own lines in the south. The first section of line was built between Didcot and Newbury and opened in 1881. The company's next priority was the construction of a terminus and track at Southampton. However, the company's operating and construction costs spiralled, and income from the short stretch of line already open was low. Work on the route into Southampton stopped in November 1883 and the company concentrated on reaching Winchester. This was achieved in 1885, with a new station being built in the Cheesehill (now Chesil) area of the city, reached by a tunnel under the St. Giles district. The station was located within 1/4 mile of the cathedral and city hall, by foot much closer than the LSWR (extant) station, on a cramped site right next to St. Giles' Hill. Despite this large section of new line, the railway's revenue remained low and costs continued to rise. In June 1885 the company estimated that it required £100,000 to complete the line into Southampton, and Winchester and Southampton Councils invested £15,000 and £70,000 respectively. However, the money was rapidly spent on the existing line's upkeep. The DN&SR's main problem was that without an independent line to Southampton, it could not attract the key heavy goods and express passenger traffic that it anticipated. However, without the income this traffic would provide, it could not finance the final section of line. The GWR, although running the line, was reluctant to assist for fear of angering the LSWR, and the LSWR similarly kept its distance (despite their rivalry, the two companies, through necessity, operated many joint services over each other's rails, which either company could disrupt if it felt the other threatened it by investing in the DN&SR). This situation continued for a short while, until the LSWR, fearing that the GWR may eventually finance the completion of the railway, offered a compromise. It would construct a short connecting line from the DN&SR's Winchester station to its own main line and allow DN&SR trains, run by the GWR, to run along the line to Southampton. In return, the DN&SR was not to seek an independent route. This line, running over the Hockley viaduct, was completed in 1891, and services from Didcot to Southampton began shortly after. The DN&SR joined the LSWR line just north of Shawford station. The LSWR also insisted on only using its own locomotives on the section between Winchester and Southampton. Trains arriving at Chesil from the north had to stop whilst the GWR engine was uncoupled and a LSWR one attached (with the reverse happening on north-bound services). This delay almost totally negated the fact that the line was one of the shortest routes from the Midlands to the south coast. The line did have its uses – it allowed a direct route from the South Wales Coalfield (accessed by GWR main-lines) to the Southampton Docks, but passenger traffic remained low. The railway lost its separate identity in 1923 when it was fully amalgamated into the Great Western Railway. When trains from the north-west of England started services to Southampton in the 1920s, it was hoped the DN&SR would provide the crucial north-south link, but most trains were routed via Reading with faster lines and greater capacity. During the 1930s the line was downgraded, with the removal of most passing loops and signal boxes that weren't in stations. Station staff numbers were also reduced. At the same time, the section of line around St. Catherine's Hill, north of the Hockley Viaduct was moved west by around 55 feet to allow the construction of the Winchester Bypass section of the A33 road (now itself removed). During the Second World War the line was a crucial transport link as southern England saw huge movements of troops and military supplies, with intensive use in the run-up to D-Day. This saw the rapid re-construction of the passing loops and infrastructure removed only a few years previously- all of which were re-instated within days by intensive engineering works. The line was closed to passengers from August 1942 to March 1943 to enable it to carry the extra freight and military trains. However, after 1945 the line returned to its lightly-used state. Notable engineering features of the line are few, but Hockley Railway Viaduct is one of them, being the longest railway viaduct in Hampshire, and the earliest modern structure confirmed as having a solid concrete core. The line made railway history in that it was the first to employ a "steam navvy" (a steam-powered mechanical digger) in its construction. After the Second World War, the DN&SR returned to being a rural backwater line. Following railway nationalisation in 1948, the railway was merged into the Southern Region of British Railways, thus putting it under the same direct management as the South Western Main Line. It was deemed unnecessary to have two lines that so closely paralleled each other, and plans were made for the line's eventual closure. Passenger numbers on the DN&SR slowly declined throughout the 1950s, although goods traffic remained healthy- especially chemical and oil traffic to Fawley Oil Refinery. Like many rural railways (including the LSWR's own 'second main-line' in the region, the Meon Valley Railway) it was finally deemed politically to be uneconomical to operate and was closed as part of the 'Beeching Axe' in the 1960s. The line was closed south of Newbury in 1965 and north of Newbury in 1967. Parts of the railway's course and earthworks are now used by the A34 road between Newbury and Winchester. The road generally closely follows the railway's former course. In villages formerly served by the railway, such as Sutton Scotney, the remains of bridges and earthworks are still standing. This page was last edited on 9 November 2015, at 15:28.